The Cinque Terre map is here to help you find your way to and around its five small villages and their rocky coastline that stretches from Mesco Point to Montenero Point, ten kilometres or so from La Spezia. The five lands are located on the eastern coast of Liguria, named the Riviera di Levante. You will be able to explore Cinque Terre through the traditional, illustrated street map, or you can flip over to "satellite" mode and see satellite images of parks, paths and old ways. Google Maps offers the best, most up to date, ad-free, detailed Cinque Terre map available today! To see images and photos of the roads in the map, click Cinque Terre Map here and then click on the little person figure above the + zoom option and grad it to the map. For example, place the little person figure (shown on the right) over Monterosso al Mare and see the winding road leading to town… For even more fun and pictures, as well as to get a real feel for the area, view teh map in Google Earth by clicking on the "View in Google Earth" option above the map. If, on the other hand, you are looking to find the distance from a starting point to the Cinque Terre i.e. 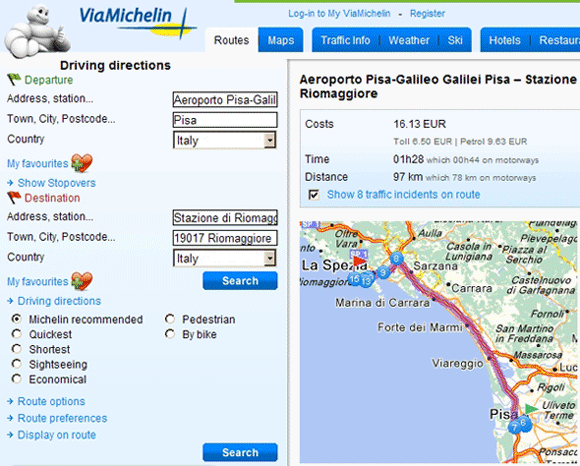 the distance from Pisa to Cinque Terre , we recommend you look at the AA maps of Michelin. Michelin driving directions from Pisa to Riomaggiore. 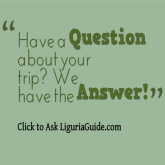 You can find further useful travel advice on getting to Liguria, on our dedicated section on Liguria Travel. 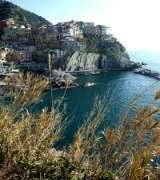 As well as the latest Cinque Terre Weather info here.